It’s that time of year again. Warm coats, boots and gloves, fireplaces and hot cocoa. With all that warmth comes a little cold. Icicles, slippery roads and snow. Lots of snow! We can’t avoid it so we may as well embrace it. With all that snow cones the extra chore of snow removal. And removal means shoveling. Some of us may be blessed with snow blowers that will help make this chore easier and faster but most of us are stuck with the traditional shovel. Shoveling can be a demanding activity at times. 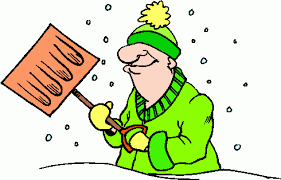 It is important to make sure you are shoveling properly to avoid injury. 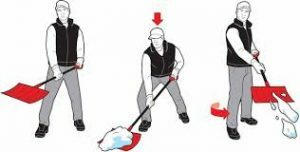 Due to the physical demand shoveling has on the body it is also important to pay attention to any physical signs of distress during or after the activity. Today we will look at proper technique, how to avoid injury and paying attention to body and your health. 1. First find a shovel that fits your needs and is sturdy. 5. Keep up with the snow fall. If a big storm is headed your way it is easier to shovel a few times during the storm instead of waiting for the storm to end. You will avoid dealing with heavy snow falls and having to dig yourself out. 6. Stay hydrated. You can quickly become dehydrated during shoveling. You may be sweating and not notice due to the cold weather. Drink water before, during (if necessary) and after shoveling. Avoid caffeine as it increases dehydration. 7. When lifting, bend at the knees. Bend at your knees keeping your back straight. You’ll have more strength and you will avoid back strain. Let your legs do the work. Following these tips will help you avoid injury. Other tips include wearing proper shoes (boots) and clothing (hats, gloves, scarves) to avoid cold exposure and slip and falls. Place one hand closer to the base of the shovel and the other hand closer to the handle. This gives you more control over the shovel and avoids muscle strain. Remember to hydrate properly and bend at the knees when lifting. When shoveling pay attention to your body. If your back hurts slow down. Try gentle stretching. If this does not help stop shoveling and rest. If you have trouble breathing, feel your heart racing or feel any discomfort in your chest STOP shoveling. These symptoms should be investigated by a physician. Even if symptoms improve with rest your doctor should still be immediately informed. Symptoms can become worse very quickly and shoveling does put a high physical demand on the body. Listen to your body. Take care of your body. If you have a history of heart related health issues (previous heart attack, heart surgery or history of heart disease) do NOT shovel without your doctor’s consent. This is also the time of year when you want to check on family, friends and neighbours. Make sure they have help when needed and that their health is been monitoring during activities like shoveling. In past years there have been an increase in heart related events during the winter months and physical outdoor activity. Help older neighbours. Ask for help when you need it. Clear snow from all emergency areas (around fire hydrants) and keep sewers clear of snow and ice. Stay alert and we will all be safe.